You can click the thumbnail images below for more and larger images. 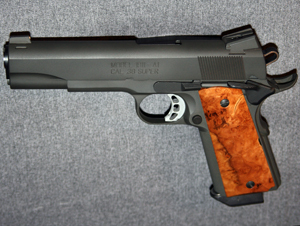 This Springfield pistol has been completely revamped with a match grade barrel and bushing and match grade lock work. It has an adjustable Novak rear sight with a Novak gold bead front. The stock main spring housing was replaced with a new one and was re-checkered to match the front strap checkering. The front strap was moderately raised and then blended. The grip safety was replaced with a beavertail and the thumb safety was blended to the backstrap. 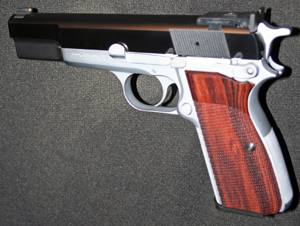 This Browning Hi-Power pistol was rebarreled with a Bar-Sto match grade barrel. The slide was milled by JRH for this Champion (formerly Bo-Mar) low mount rear sight (note how far back Jack Huntington was able to mill this in), and the front sight is a Novak gold bead. The slide received a master finish and was blued with Brownells bluing formula for a beautiful deep blue color. The front and backstrap were checkered with 30 lines per inch which makes this pistol grip beautifully in the hand. 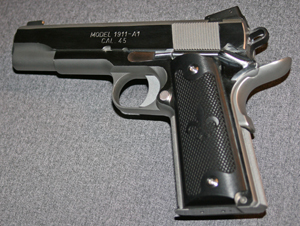 The front strap was also raised slightly and blended before checkering the bottom of the trigger guard. The frame was then hard chromed by Accurate Plating after it was bead blasted. This Colt 70 Series pistol has a match grade Springfield slide fitted with Novak adjustable rear sight and a Novak gold bead front. It has a Kart match grade barrel and bushing, and is a very accurate gun. The lock work was completely replaced with match grade parts. The beavertail grip safety was added and the thumb safety was re-contoured to match the frame perfectly. The main spring housing and front strap were checkered with 30 lines per inch, and the front strap was raised moderately and then blended.